Experience a better shower with the control and flexibility of a Delta® hand shower. Great for showering yourself or your loved ones and pets, as well as for keeping your shower and tub clean. While other products may gather unsightly mineral build-up over time, Delta soft rubber Touch-Clean® spray holes allow any mineral residue to simply be wiped away for an instantly refreshed look – with no need for soaking or the aid of chemical cleaners. The pause setting gives you ample space for shaving, lathering and other shower tasks, then easily restarts the water with the temperature where you left off. This spray setting helps you conserve water, so you can worry less about depleting your supply of hot water - and you help the environment too. i need to replace the hose for this product. which one do i need? Is this made of plastic?? If so, what hand-helds are NOT plastic? thanks. On the traditional hand shower can the spray pattern be changed by user from regular spray, to pulse spray, to hard spray etc. Thank you for your question. 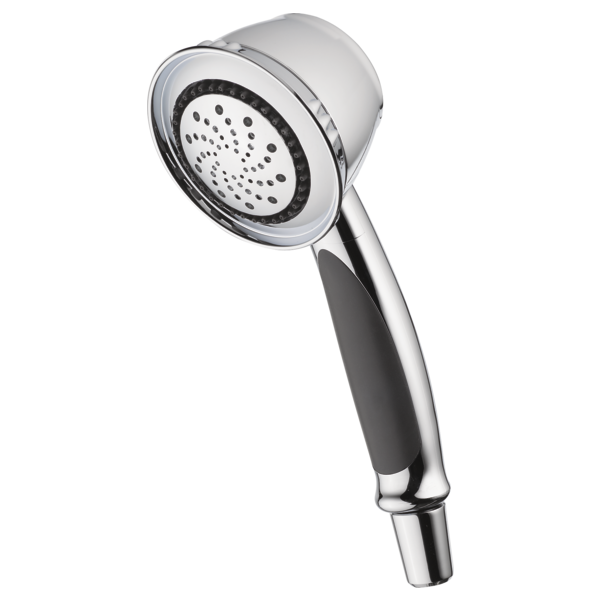 Delta Faucet model # 59478-SS-PK is a five setting handshower. The five settings are: Pause, Soft drench spray, Fast massage, Full spray w/massage, and Full body spray. This model is the handshower only. The hose is not included. Can this hand shower be deck mounted for a drop in tub? If not, what do have that can be in polished brass?